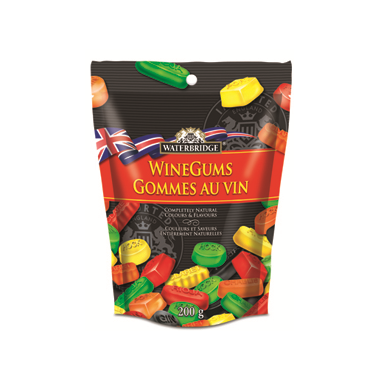 Skilled confectioners maintain the traditional chewy texture and the full rich flavour that has made Wine Gums a preferred choice among candy lovers for over a century. All natural colours and flavours. 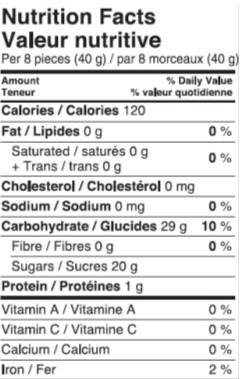 Ingredients: Glucose syrup (contains wheat, sulphites), sugar, modified maize starch, water, modified potato starch, gelatine, lactic acid, acetic acid, natural flavourings (raspberry, lemon, lime, orange, pear, blackcurrant), natural colours (anthocyanins, paprika extract, curcumin), palm kernel, sunflower and coconut oils, vegetable concentrates (nettle and spinach), beeswax. My favourite candy ever. These wine gums taste like wine gums should and there's not artificial colours which is great. I love these. They're a bit softer than the Maynard's & not as acidic.